Registration for the Spring 2018 semester is open now! For information about signing up for spring classes, visit www.kellogg.edu/registration. To apply to KCC online for free, visit www.kellogg.edu/step1. 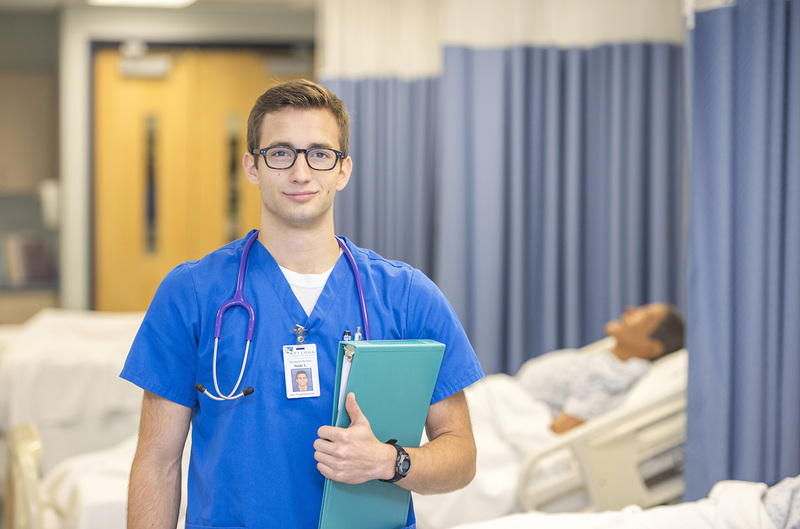 When asked why he decided to pursue a career in nursing, 18-year-old Kellogg Community College Nursing student Isaac Lake says there are a few different reasons. His mom was a nurse, for one thing, and his dad is a sleep tech at Bronson. And everybody that he’s talked to who works in the medical field really likes their job, he says. But Lake’s ultimate motivation came when he was 16, when in the course of a complicated pregnancy his little sister, one of a set of twins, was born more than a month premature and ended up in the neonatal intensive care unit (NICU). One of the twins didn’t make it, but his little sister pulled through. Lake’s sister is now 2 and full of life, Lake says, the youngest of his five younger siblings. Lake also has an older sister. Home-schooled through high school, Lake dual enrolled at KCC and completed all his prerequisites for the KCC Nursing Program before graduation. “I had a really good experience here, so obviously I liked it enough to come back for the program,” Lake says. Dual enrollment helped him knock out eight classes and more than two dozen credits before he even started the Nursing Program this fall. In the spring, Lake was awarded the KCC Foundation’s Gold Key Scholarship – the College’s most prestigious scholarship. As for the future, Lake says he plans on working towards a bachelor’s degree, and possibly a master’s. He might even end up working in a NICU himself someday. Right now, he says, he’s still kind of getting his feet wet in the Nursing Program. Applications for KCC’s Fall 2018 Full-Time Nursing Program are available now! Visit www.kellogg.edu/nursing for more information.